I prefer the 24" 5" rear wheels. I prefer the Oval Cut-Out U-Shaped seat. I prefer the 17.5" 14.5" back height. The E&J Shower Commode wheelchair can be generally categorized as a rehab wheelchair. Graham-Field - the manufacturer of this product - specifies this chair as follows. 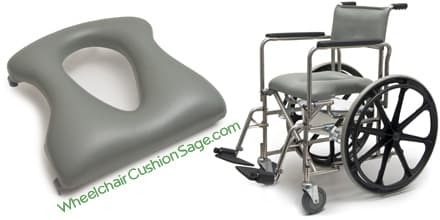 Seat Height from Floor: 23.5"
The E&J Shower Commode wheelchair is Graham-Field's remake of the popular Everest and Jennings rehab shower commode chair. This E&J chair can fold from its 25" overall width to approximately 14" wide for storing or transport. The standard rear wheels are 24" in diameter and can be braked (ref. 3rd section of picture below). The optional 5" diameter rear wheels exhibit a locking mechanism. A plastic pail and lid; together with the associated hanger for mounting the pale underneath the seat, are all included with this chair. The foot rest height is adjustable via a telescopic motion that is secured with a nut and bolt (it's similar to adjusting the height of some bicycle seats). The composite footplates - the two flat surfaces on which one's feet actually rest - can hinge upward to accommodate folding the chair (ref. 4th section of picture below). The foot rest hangers; which includes the footplates, can be removed entirely or can swing away. The left foot rest swings left and the right foot rest swings right. The swing-away motion is accomplished by pressing the lever on the foot rest hanger (ref. 5th section of picture below). The foot rest hangers do not need to be lifted in order to swing away. The standard seat exhibits a pear-shaped opening (the manufacturer refers to it as an oval shape). An alternative U-shaped seat may be substituted for the standard seat. Removing the E&J chair's left or right arm entails pressing a button on the front side of the arm (ref. 2nd section of picture below) while simultaneously lifting the arm out of its two receptacles. The standard front casters do not lock (ref. 6th section of picture below). Caster pin locks are an optional feature. Seats and other individual parts are available here - call for details.